Sometimes, as the result of a mistake by the insured, multiple property or liability insurance policies will provide coverage for the same event, and no policy will effectively have made itself "secondary" or "excess" to the others. In these instances, the law must allocate responsibility among the insurers. There are two main methods for "coordinating" these policies. One method is "pro rata by limits" in which each policy pays in proportion to its relevant limit. 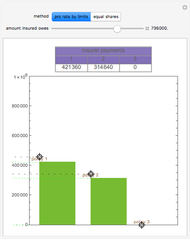 A second method is "equal shares" in which policies pay equally until they are exhausted, with larger policies being invoked in the event any equal payments theretofore made do not satisfy the amount owed by the insurer. 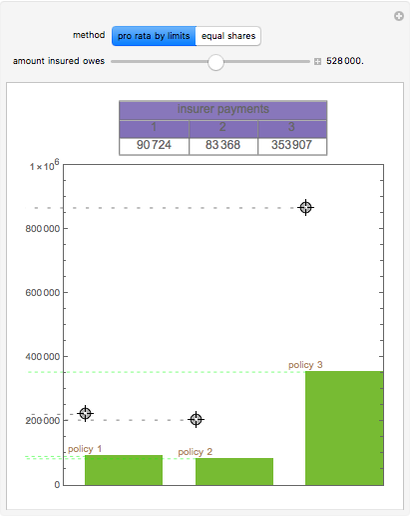 This Demonstration lets users coordinate up to three insurance policies. 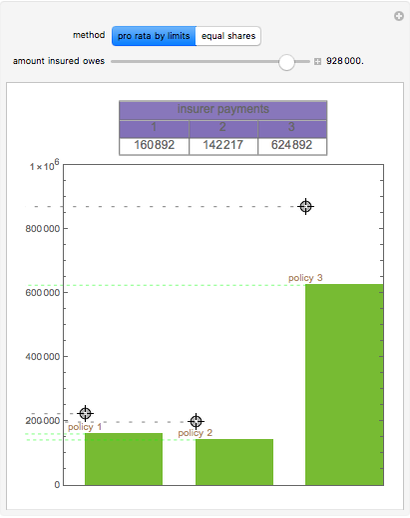 Users can set the amount owed by the insurer, use locators to set the policy limits, and choose the method of coordination. Snapshot 1: pro rata by limits for the same liability amount and the same insurance policies. Snapshot 2: equal shares for the same insurance policies as in the thumbnail, but for a lower liability amount. Snapshot 3: two insurance policies coordinating using equal shares. In the real world, things can get more complicated. There is, for example, the issue of how to handle deductibles and coinsurance. And so-called "time on the risk" may be relevant to the amount each insurer owes. Seth J. Chandler "Coordination of Insurance Policies"